Any particular new features in this new installment that we’ve never seen before? We’ve introduced a new progression system to HITMAN 2 that is centred around mastering locations. As you level up the Mastery track for each location, you unlock starting locations, agency pickups and new items that give you new options to take on each mission in new ways. Progress can be achieved by either completing Challenges or earning Performance XP. Performance XP is a new system and acts as a second avenue to accumulate experience points. The Performance system awards a small amount of XP for doing moment-to-moment actions during a playthrough, like taking someone out silently, hiding a body or killing a target. By default, Performance XP will be displayed as you perform the action in-game, but this can be toggled on or off in Settings. The AI has seen considerable improvement from Hitman to Hitman 2, what should we watch out for when trying to get Silent Assassin now? The team has indeed worked very hard to improve our AI, enhancing not only their awareness and information sharing, but their combat methods as well. You’ll have to be much more aware of your surroundings, making sure that you don’t get spotted doing something illegal, or trespassing where you don’t belong while in view of a security camera. In doing so, the security monitoring the feed will immediately send in the closest guards to come and investigate your position. Furthermore, NPCs will react to everything they see in the reflections of mirrors, so you can’t just sneak up on somebody with your weapon drawn and not expect them to react. When/if you do find yourself in a combat situation, you’ll notice that the AI are a lot smarter this time around and will work together to flank and flush you out. Some guards will move into a position to ensure they’ve got the perfect shot lined up before pulling the trigger, while others might be overcome by the adrenaline of the situation and hit the environment around you. Do players still have the element of freedom to minimize or disable in-game opportunities, letting players pave their own way through the game, so they’re no longer shown obvious hints or tips as to where they should proceed through the level? Yes indeed, we want to give the player as much freedom to play the game exactly how they would like to. Firstly, the Opportunity system has had a bit of an overhaul and now comes in the form of Mission Stories. These Mission Stories’ assistance can be set to either Full, Minimal, or Off, depending on how much guidance you want, and how you want to play the game. The same goes for your Picture-in-Picture feedback, Low Vision Area indicators (when hiding in crowds/foliage) and many other HUD elements. The Hitman franchise is known for the comedic way you can neutralise your target. 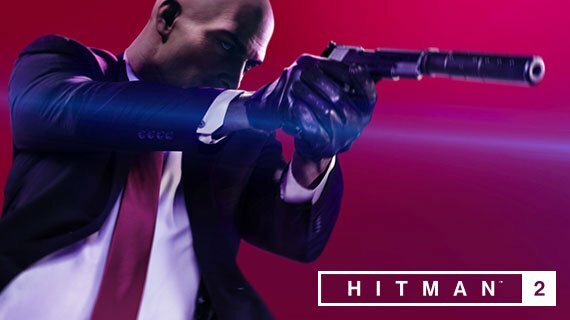 Is there an assassination method in HITMAN 2 you are particularly looking forward to players experiencing? What is the developers favourite disguise in-game, i.e. flamingo outfit? HITMAN always presents a plethora of possibilities to successfully clear the missions, catering for various different approaches and styles. Some of those result in very extravagant endings while others are more subtle. Some are very dark, and others lean more towards the humorous or absurd. It’s honestly a balancing act, keeping things from becoming either too grim or too silly. It’s about what makes sense in that environment/location. So we love having the flamingo mascot disguise you can find at the race in Miami, and in Santa Fortuna, Colombia, the tattoo artist disguise has proven to be quite a favorite of the team. In terms of assassination methods – the wildlife in Colombia offer some very intriguing ways to dispatch your targets, from flesh eating piranhas, to poisonous frogs, or even a very hungry hippo. Hitman 2 builds on 2016's release, adding six new locations, multiplayer, co-op and new Elusive Targets plus a number of mechanical changes too. With almost 20 years of legacy behind it, Hitman is one of the biggest franchises in gaming. We explore its history so you're up to speed when it comes to playing 2018's release.